How To Uninstall Programs in Window 8 . Window 8 packed with bundles of feature , apps and cool design which make window 8 cool Operating system . These Cool apps , Feature and Touchscreen Support helps Window 8 to boost its Performance as well as Popularity among window operating user . 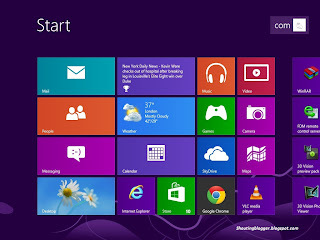 Although Window 8 design is user friendly but due to its Completely new look as compared to old Window operating system . A Brand new window 8 user experience a bit Difficulty to operate and find some basic function as compared to older Window version . Actually all the basic function like Installing program and uninstalling and programs related to Window , control programs exist in control panel in every version of Microsoft window ,Only thing that got changed in window 8 is the Shortcut for those Basic Function has been Removed and merged in control panel. 1 : Sweap your Mouse Pointer to Extreme right corner of taskbar to open Quick bar which contains options like Setting ( Gear icon ) , Devices ( Devices icon ) , Start ( Window 8 icon ) ,Share ( Share Icon) , Search ( Lens icon ). 2 : Now click on Settings ( Gear icon ) , Settings window will pop up at right side of Window . 3 : Under Settings Window , Click on Control Panel . 1 : Right click on blank area of task bar and Click on Show the Desktop . 1 : When you click on Control Pannel under Settings Window , A new Window will appear named as all control Pannel items . Step 5 : Under All control Panel items , Find out Programs and Features and Click on it .Programs and Features window will open up . Step 6 : Now Click on desired program you want to uniinstall from Programs and Features window ,and Click on uninstall and confirm uninstallation (uninstall or install will occur when you click on any Program under Programs and Features window ) .